When John Soule urged young men to "go west," in 1851, it wasn't just places like Yellowstone which were undeveloped. Nearly the entire western part of the country was referred to as a great "wilderness," and there were few recognized passes on which to travel. Although Lewis & Clark had completed their journey earlier in the 19th century, no transcontinental railroad yet existed. About seven years after Soule's article, the first non-stop stage coach left St. Louis for Los Angeles (in 1858). That 2,600-mile journey took twenty days. What did the American West look like at the time? 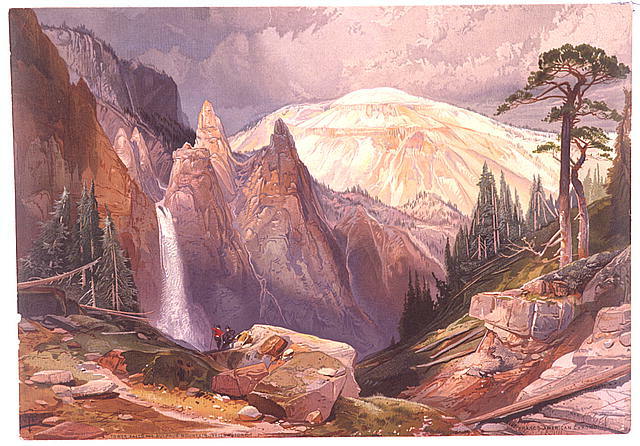 The Library of Congress has magnificent paintings and drawings (from the federally sponsored "Survey of the West," U.S. Geological Survey of the Territories) which answer that question. They reveal scenes observed by men and women who first heeded the call to cross the Mississippi River and develop the country's vast open spaces. Some places have changed little between then and now. Other areas, once inhabited only by Native Americans, are no longer recognizable. Let's examine a representative sampling of paintings and engravings. Bos, Carole "THE AMERICAN WILDERNESS" AwesomeStories.com. Aug 01, 2005. Apr 20, 2019. Map Depicting Native-American Lands in the U.S.